There’s something to be said for the cultural influence of a specific region creating, shaping, and-or preserving the love of a musical genre across years and years of time. It’s a phenomenon that’s steered the stories or rap and hip-hop, jazz, and of course, folk music. 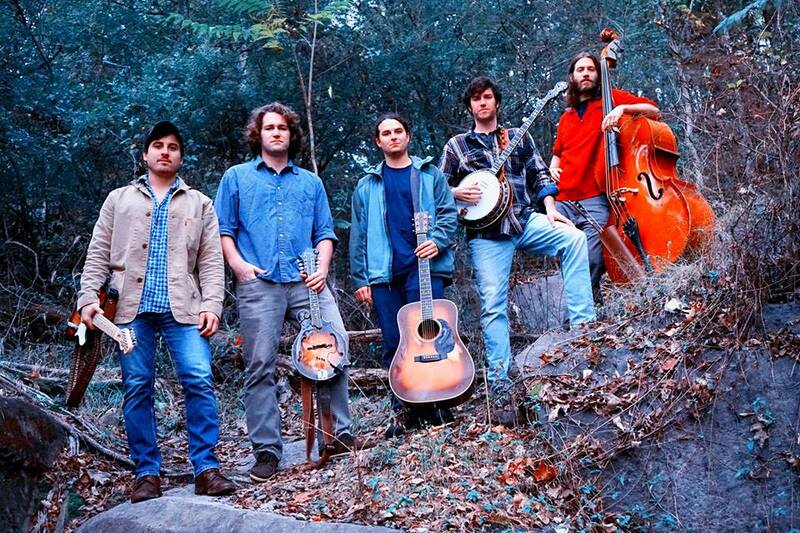 While five piece independent bluegrass band, South Hill Banks, is more progressive than parochial in its pursuit and love of the music of pickin’, the group’s newest single, “Appalachian Blues,” pays homage to one of the most iconic elements associated with regionally nurtured folk music: the Appalachian Trail. Following the release of lead single, “Moving on My Mind,” for upcoming new album, No Time for a Breakdown, which is due out 9 November, South Hill Banks are revving up for their first release as a five member band with “Appalachia Blues.” And though Appalachia, in all of its multi-state wide glory, is a region that encompasses an assortment of localized and niche social cultures, South Hill Banks instead brings musical accessibility with a modernized and approachable take on bluegrass – a musical style that faces its own set of occasionally pedantic sonic expectations. While bluegrass traditionalists of the world would balk at South Hill Banks’ exclusion of a fiddle player in its lineup and, “even worse,” the contrasting inclusion of an electric guitar, that’s what gives this Richmond, Virginia quintet its stylistically flexible strength. Leaning toward not only the traditional bluegrass formula but also the live spirit of jam band music, South Hill Banks initiates a musical idea from a more conventional perspective and by the completion of a song – in this case the motif driven “Appalachian Blues” – instills in the mind’s eye, just how much more exciting, spunky, and conceivably addictive a live performance of the band’s music can be. “Appalachian Blues” as an individual piece of writing, continues South Hill Banks’ overarching concept of starting from a place of formality and deviating to make something new. Now, it should be noted that nearly right off the understanding that South Hill Banks isn’t about just playing in the traditional lines, “Appalachian Blues” stokes surprise when the initial expectation of no fiddle is immediately cast aside when prolific jazz violinist Alex Hargreaves busts out a part that is half planned and half sheer heartfelt fiddle experience and execution. This one element alone livens the music greatly, as the fiddle can and does inherently contribute an agile and beautifully improvised set of sliding, intermittently double-stopped notes, gliding along beneath the nimbly picked banjo and acoustic guitar that perpetuate the song’s primary 14 note hook during the chorus. Then when it gets the chance to spectacularly shine in during the first instrumental interlude, that’s when imagination can really kick in and grow, following every interlude thereafter. It becomes entirely feasible – even for those who have yet to see this venue-prolific band in person – to picture South Hill Banks cranking out the energy of a fully amplified band and for the chemistry between these five (particularly brothers and founding members Eric and Ryan Horrocks,) to enable the group to effortlessly feed off each other and play improvised riff after improvised riff, well past “Appalachian Blues'” 3:38 run time. Suddenly, any and all memory of what actual song was being performed is lost but instead, replaced with open-ended potential for zealous and giddy interaction between audience and band that often ends in a crowd that just keeps wanting the band to come back for more. The fervor for this scenario only increases with more observation and contemplation, as one considers that “Appalachian Blues” hones in on the lyrically limitless spirit of 12-bar blues writing with its repeated chord progression and the titular refrain that follows every verse. However, the band’s gently modernizing approach widens the structural scope just enough that the song can progress with something more akin to a ABAB style flow rather than the dually sung, single line verse style of the traditional 12 bar form. Add onto this the interchanging emphasis of fiddle, banjo, and electric guitar respectively between each section and what can sometimes end up being a predictable listening experience (and thus solely, if not at least heavily, dependent on performance style and artistic delivery to create tension and excitement), becomes full of unknowns for how each of the band’s players will choose to shape their designated improvised solo. It’s another reminder of potential for variation from one performance to the next and why the conversely minimal amount of chord diversity shouldn’t leave anyone with an impression that South Hill Banks doesn’t have much to offer in the way of creativity. Moreover, realizing the setup of this band differentiates only slightly from that of progressive bluegrass icons, Punch Brothers, and hearing first hand that South Hill Banks’ collective musical skill and performance quality is very much similarly clean and crisp, it also becomes exceedingly easy to think of the band’s potential down the line, as being capable of connecting with that same cross-generational, cross-genre and, to and extent, newly intrigued bluegrass crowd. “Appalachian Blues” is just one piece in a much bigger plan for the continually evolving future of South Hill Banks. Nonetheless, for as much as a person can take away from a single song, off the first album of a new band configuration, this bout of the blues entices with more than enough demonstration of artistic promise and curiosity for what the band can do outside the studio, to ensure the only logical choice is to get up, and prepare to join South Hill Banks for what’s bound to be a long and musically riveting journey. “Appalachian Blues” is available now. Pick it up through iTunes, Google Play, and Amazon. Stream the song and follow the band on Spotify. Look for forthcoming album, No Time For A Breakdown on 9 November 2018. Pre-orders and special album release merch packages are available now.